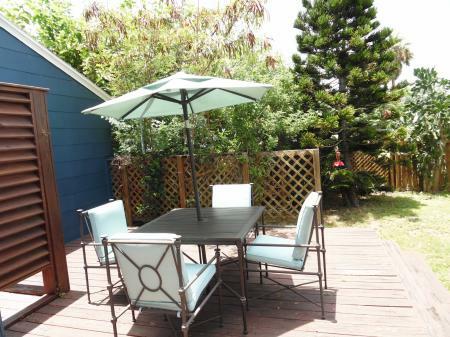 The BLUE BUNGALOW is new to the vacation rental market in Port Aransas.��In the south, we love to invite our friends to come in the back door, feel right at home and stay a while. 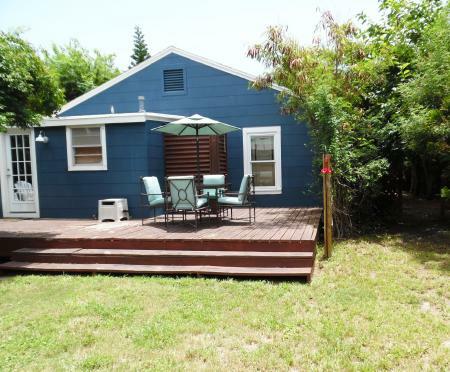 The Blue Bungalow will make our guests feel like old friends! 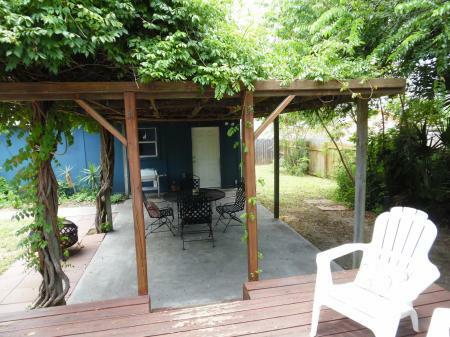 You will enter the property through the back gate into the yard which is fenced for privacy! 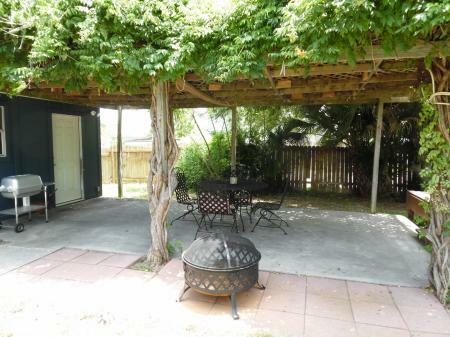 The outdoor space is fantastic with a welcoming shaded arbor which is covered in a native trumpet vine which blooms coral flowers through the year. 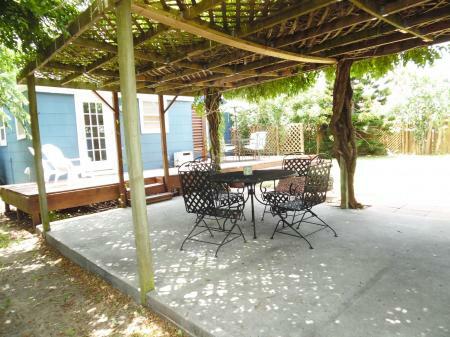 Under the arbor is a outdoor dining table and four chairs and also the charcoal BBQ pit on the stone patio. 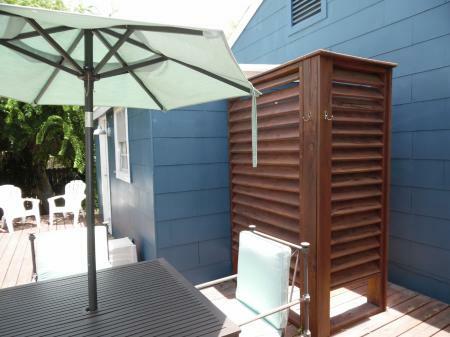 Steps lead up to the deck where another patio table with umbrella is located just beside the outdoor shower, which is going to be a welcome amenity after a trip to the beach with children and a pet. It is private so can be used as an extra shower in the summer months. 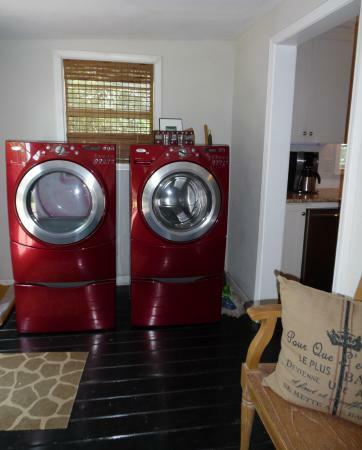 Going in the door, you will first enter the bonus room which houses the modern high profile washer and dryer. Then on into the updated kitchen with granite counters, stainless appliances, a nice center island even a flat screen TV on the wall. 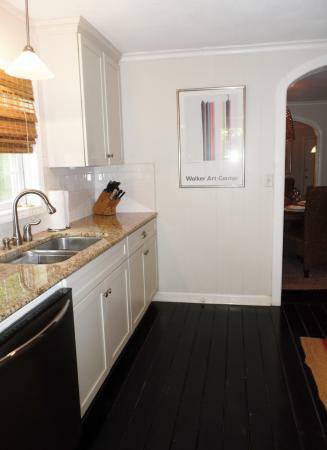 All the floors in the home are painted wood planks and will be easy to care for. 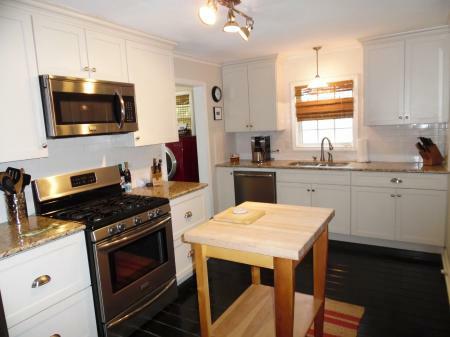 The kitchen has an over the sink window allowing lots of natural light into the space. 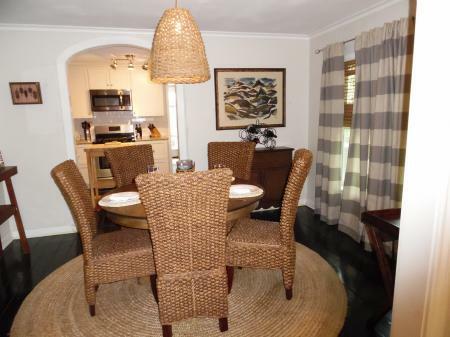 A big opening then leads to the dining area with its tropical feel of wicker hanging lights and wicker dining chairs. It is the perfect size for 4 guests. The dining room is open to the living area which has a traditional sectional sofa on 2 walls, lots of natural light and on the wall opposite, a huge flat screen TV surrounded by lots of books for your reading pleasure. 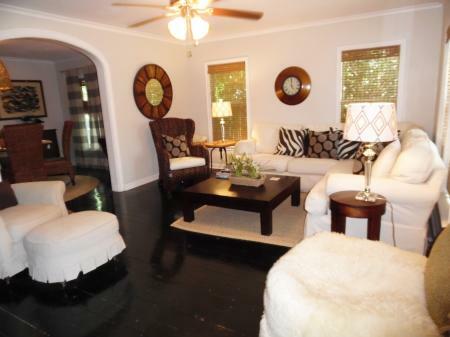 Tucked in the corner there is a comfy overstuffed chair and ottoman which beckons you to sit back and relax. 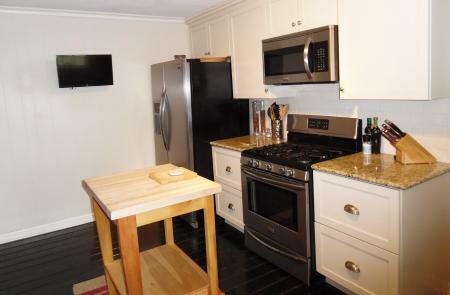 Off the hall way from the dining area is the nicely updated bathroom appointed with stone countertops. The double size shower is tiled from floor to ceiling and has two shelves for all your shower/bath products. The glass wall gives you lots of light. 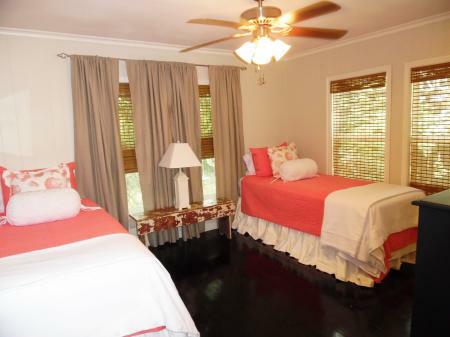 The house has two nice bedrooms, one with twin beds and beautiful natural light. 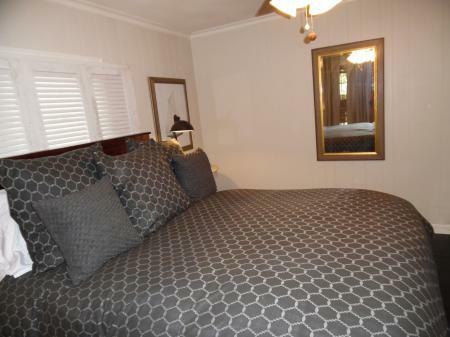 It has a breezy ceiling fan and good light for reading, a chest of drawers for storage, and a closet. 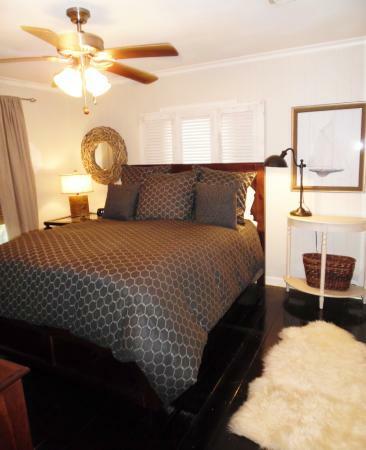 The master bedroom has a really comfortable queen bed with high end linens, a flat screen TV and a spacious dresser and closet. The Blue Bungalow has everything you need for a well appointed comfortable beach vacation and you will want to return time after time.